Dreambox Learning uses formative data embedded within lessons to tailor the experience for each individual student. Just as technology has rapidly advanced the healthcare and communications industries, it also is being used to transform education. According to the National Center for Education Statistics, the majority of classrooms across the U.S. now have computers and Internet access, and investment in educational technology (edtech) is reaching record highs. One of the most promising applications of edtech is the ability to generate and analyze data, which empowers a deeper understanding of how students learn. By obtaining individual insights and developing a more personalized learning experience for students, teachers can be empowered with the data needed to differentiate instruction for all students, transforming the way students learn math. This is the mission of DreamBox Learning® Math – its Intelligent Adaptive Learning platform uses formative data embedded within and between lessons to “learn the learner,” offering the just-right lesson for each individual student and motivating him or her to persist using game-based strategies and engaging virtual manipulatives that get students to lean into math. The platform analyzes 48,000 data points per hour, per student, and the data generated provides teachers, principals, and district administrators, with insights about learning pace, proficiency gaps, and surfaces opportunities to adjust a student’s learning path that never existed before. Districts and schools in all 50 U.S. states and 11 Canadian provinces have embraced what DreamBox Learning has to offer. DreamBox currently serves nearly 1.5 million active students and more than 75,000 K–8 teachers, and delivers more than 1 million math lessons daily. Yet, to fully utilize the rich and deep data, the company wanted to move beyond spreadsheet reports and deliver easy to interpret, actionable insights that are relevant for each type of user. Recognizing the complexity of the challenge, DreamBox Learning sought a partner whose design and development expertise could help bring their vision of personalized learning to life. 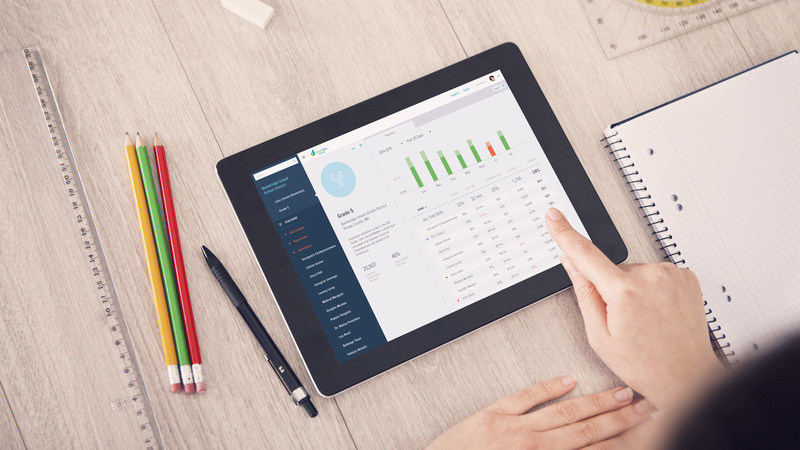 The result is DreamBox Learning Math’s new Insights Dashboard, an intuitive, actionable application that features nearly real-time data visualizations, which allow educators to turn data into insights. 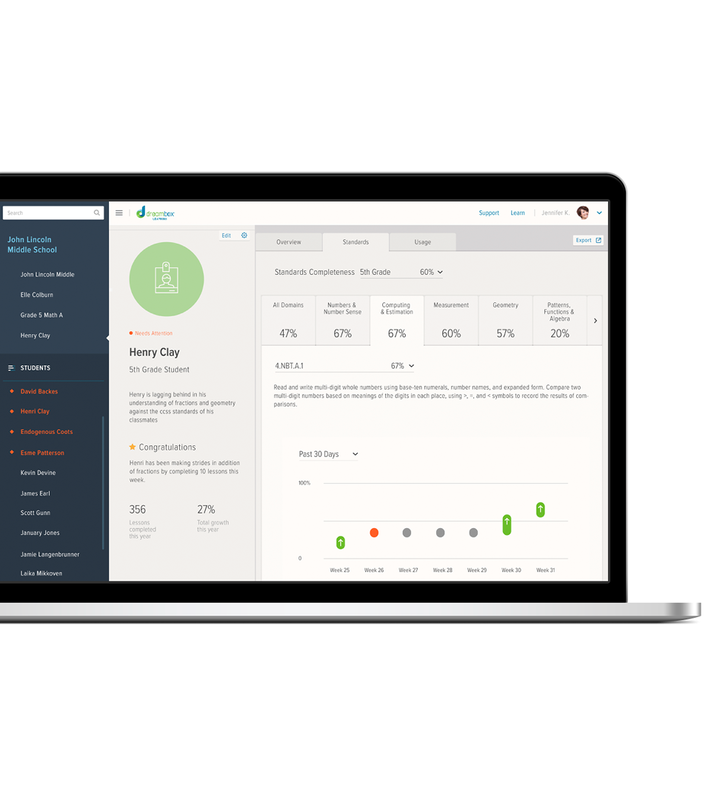 With easy-to-read progress reports, a simple and clear information architecture that supports the different needs of different users, and a rich set of instant monitoring and notification tools, the dashboard has been redesigned to help educators better understand and implement insights about student learning. 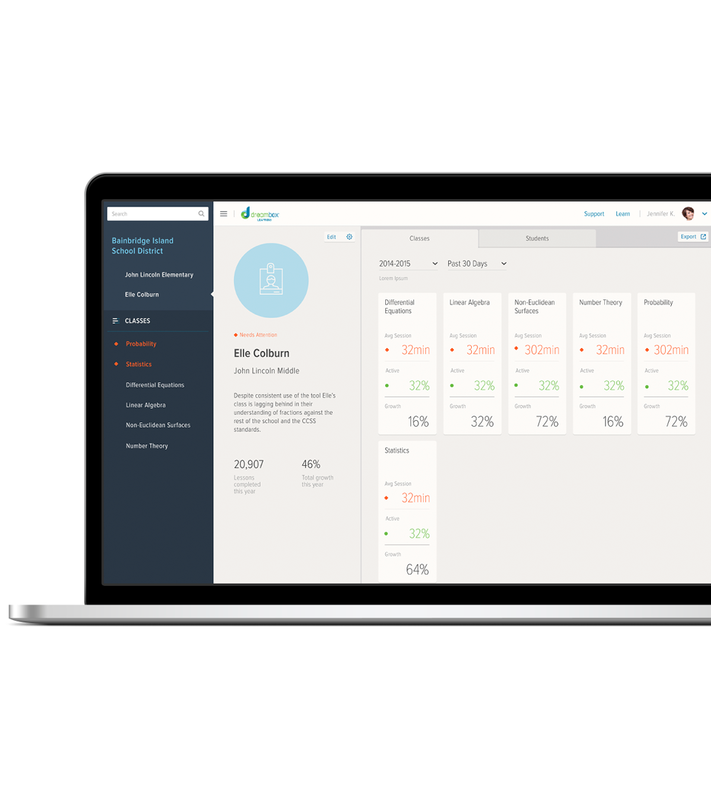 The Insights Dashboard—based on the strategy and conceptual designs below—was unveiled in late September to help teachers and administrators make confident, personalized decisions about how, and when, they connect with students. The ability to use one massive data set to tell unique stories to multiple users creates an interesting design challenge. We built a navigation structure that creates a common experience across a range of scenarios. 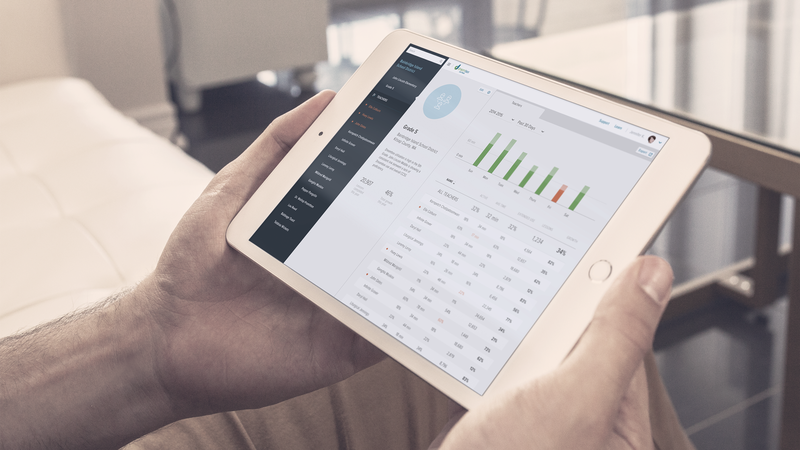 The navigation of the new Insights Dashboard allows the platform to show contextually appropriate views of the same data, making it easy for DreamBox users to access the information most relevant to them. A school administrator can see data across the district, school, and class levels together, whereas a principal’s view is focused only on their school and classrooms. Teachers see classroom and student data, and can make in-the-moment decisions about whether to stay the course or pivot to accelerate, differentiate, or remediate instruction. 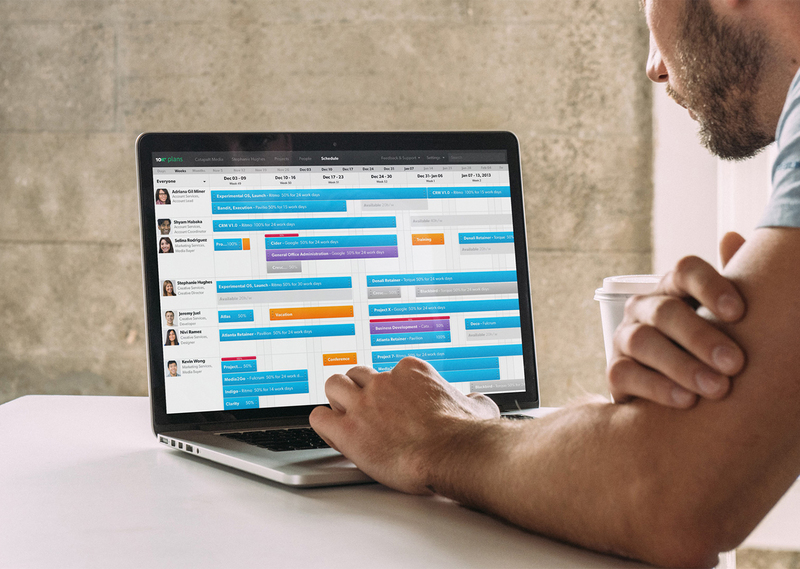 The Insights Dashboard navigation and information displays are scalable and designed to meet the needs of different user personas. Teachers can hone in on individual student performance, while school administrators can compare progress across grades, classrooms, and schools. As schools focus on curricula that align to common standards, the Insights Dashboard helps educators view real-time insights to learn when to stay the course or when to modify and differentiate instruction. At a time when funding is often tied to performance, administrators can now quickly identify which schools – or educators – may need additional resources or support, and how their student population are tracking to grade-level proficiency. The Insights Dashboard not only highlights individual achievements, but provides a historic overview of learning trends within a classroom, school, or district – giving educators new ways to analyze progress or discover new patterns and dependencies. Student spotlights elegantly show student proficiency in the context of his or her peers, alerting instructors to opportunities and needs for remediation or additional challenge. The Insights Dashboard is also designed to support activity feeds that could prompt teachers when a student is falling behind or when they’ve mastered a new skill, making one-on-one communication not only simple, but timely and effective. 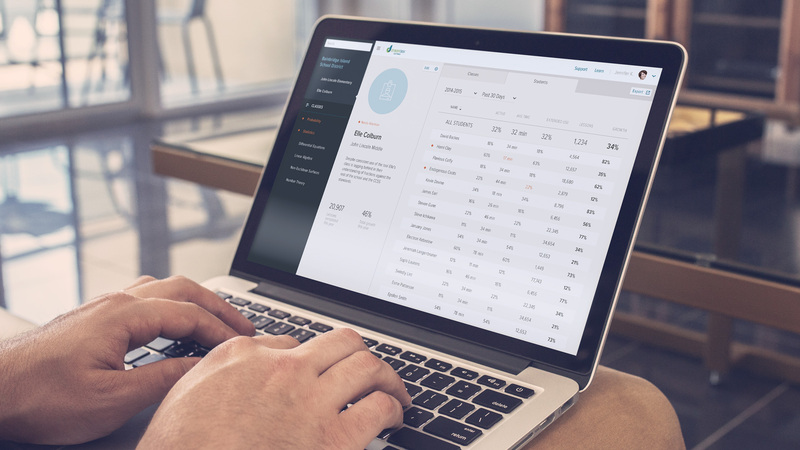 Most reporting systems are all about data intensity—cramming as many numbers and metrics into a platform as possible. But all of that information is meaningless without the ability to hone in and illuminate it in actionable ways. 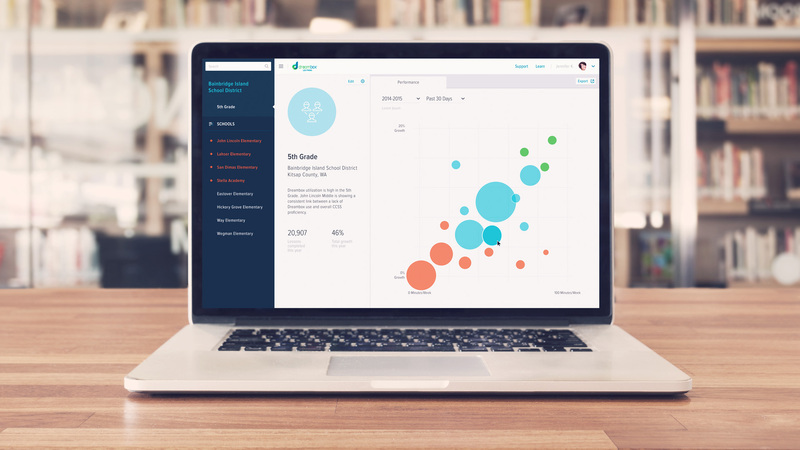 We designed interactive report building blocks to produce relevant and meaningful insights. Easily customized visualizations allow for quick data exploration and targeted decision-making. For example, the new visualizations make it easy for teachers to track and compare student progress across the curriculum, helping identify where to provide guidance and when to celebrate success. Adding more technology to classrooms does not solve one of the biggest problems educators still face: they are pressed for time and supplying personalized attention to all students is nearly impossible. To make it easier for educators to track student performance in real time, we designed monitoring and notification features that align with educators’ goals. As a result, teachers are able to differentiate instruction early and often.